Keep your wheel spinning and amazing things will happen! What is the most challenging part of any exercise? I’m sure if we asked 10 people, or asked about specific exercises, we would get several different answers. The truth is, there is only one answer, and that is: just getting started. If you have ever been on a rowing machine, the first pull is the most challenging as it takes the most strength to get the fan moving. Once you get it going, it is a lot easier to keep it going. Isn’t this life? The hardest part of almost anything we do is just getting started. When you start exercising, the most challenging part is just getting to the gym for the first time or making a commitment to take that first class. Once you get it going consistently, it gets easier and you need less motivation to make it in. Pretty soon, you want to start eating healthy too, getting enough sleep, and making sure your nutrition is on track. See where I am going with this? Before long, you are living a healthy and positive lifestyle. A Lifestyle that often leads to motivating others to begin exercising and the cycle begins again and again. Unfortunately, the same can be said for negative things, and we’ve seen it time and time again. It doesn’t take long before someone who is living a healthy lifestyle to get knocked off track by a long vacation, an injury, or getting overwhelmed at work or life. It all boils down to being mentally tough to avoid the pitfalls that will knock you off track and develop the discipline to keep that flywheel moving in the right direction and to hold yourself accountable. It’s a sad truth that people quit. As coaches, we can want a healthy lifestyle so badly for an athlete. That doesn’t mean they are willing to overcome the excuses they keep telling themselves. This is exactly how the negative flywheel effect gets going. Sure, excuses such as “being busy with work or family” are valid. However, when you get the positive flywheel spinning, all those things seem to take care of themselves. You start exercising > You eat right > You take care of your body > You feel better > You have more energy > You work harder > You want to spend more time with your family > and it goes around and around. With the right discipline and mindset, you can make anything happen. People can see your confidence, and you get to be that spark that helps others ignite their lives. I’ve seen it happen time and time again. Just watch what happens from enlistment day to graduation of the 6-week WildFire Boot Camp. People who doubted their abilities, some that were even told by loved ones that “they would fail”, not only succeed, who completely change the course of their life for the better. They become strong and confident, and the best part is that they do it together! That’s the secret right there. That’s why what we do works so well. WE ARE STRONGER TOGETHER! If you are just getting started and you know what kind of a positive impact being a part of the WildFire Community will have, I encourage you to dive in and be a part of it. Do more than just show up to work out a few times each week. Be a part of the WildFire Community. By cheering on others just like they cheer you on. 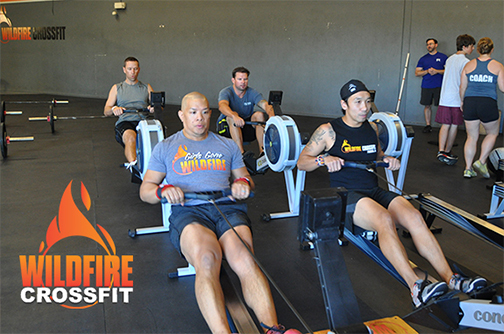 By participating in events such as the Level 1 Fitness Test this Saturday, October 13th. By holding each other accountable and taking an interest in your fellow athlete’s goals. This is how the positive flywheel keeps on spinning. This is how you have success. Sure, there will be bumps in the road. Things that come up that are out of your control. Coach Kern, who has been with WildFire almost since we started, was spending time with his son up in Payson at a Church camping event, and he broke his leg and will need surgery to repair it. Now, our thoughts and prayers go out to him and his family, and we wish him a speedy recovery. It’s his positive attitude that will get him through and keep him going. He knows he has family and friends that will be there to support and encourage him to not only recover from this injury. To get back stronger and even better than ever before. That’s how it works, and you have the power to make anything in life happen. Keep a positive attitude and continue to do what you know is right and amazing things will happen. The only people who lose are the people who quit. If you are reading this and you are still not sure of the positive impact this community can have on your life, I encourage you to get an accountability partner like a coach or a fellow member. Write down specific goals and start working towards them. There is magic in action if you are moving towards what you want most. When those speed bumps come up, you can lean on your accountability partner or partners to help get you through. Pretty soon, like in the case of Coach Kern, those people will be there for you without even having to ask because they are all spinning the same positive wheel around and around. You have the power to make anything in life happen, good or bad. When you make the choice to focus on the good, you will be amazed at where life takes you. And as always, remember that we are there to help and your WildFire Community will always be behind you!